Blue Solar Water: Why, When and How to. | Namaste to you, Sir! Blue Solar Water: Why, When and How to. 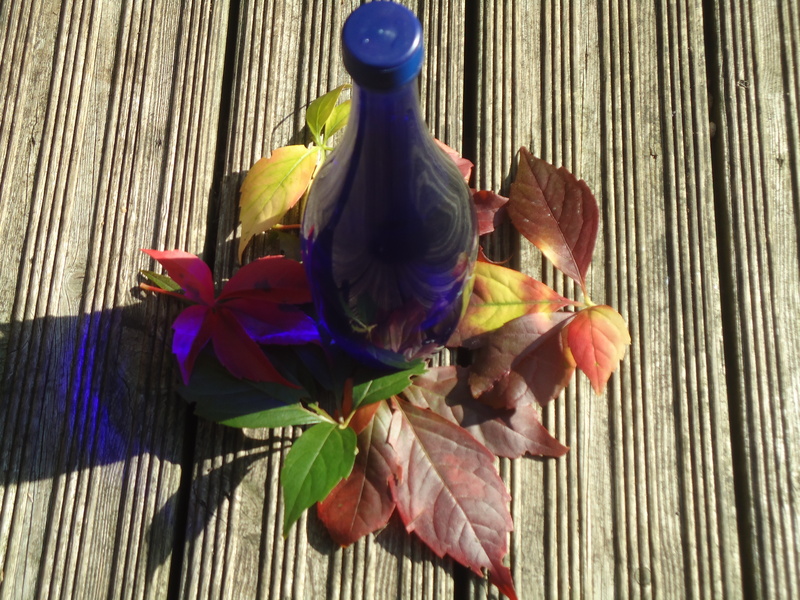 Blue solar water is a powerful tool of Ho’oponopono. The Hawaiian practice of Ho’oponopono is based in taking 100% responsibility for everything around us. We are responsible for everything we see and experience; we have created 100% of it through our thoughts and memories. To heal our reality, Ho’oponopono says, me must erase the memories that gave life to the thoughts that, in turn, created our world. Sometimes they are memories from our childhood, sometimes we inherited them from a previous generation, in both cases they can be removed so that we can create new thoughts. How do we do this? There are different ways, one of them is by drinking this water. Every time we repeat a Ho’oponopono phrase, every time we drink blue solar water, we are asking the Divinity within us to remove the memories that made us think the way we did in order to create that which we do not like in our reality. 1.- Because it will help you, in a gentle way, to change the mental patterns that created situations in your life you do not want any more. 2.- Because water is important for the body, since we are 60% water. We need it for the normal functioning of organs and cells and to eliminate toxins. However most of the time we are too busy to drink enough water. Because we are not taught how to be attuned with our body, most of us go through the day without a clue as to what our organism needs. By drinking solar water you’ll hydrate your body but also because it’s a “special” water, you are more likely to remember to drink it. Moreover, you’ll see the bottle empty or full and that will help you keep an eye on your water intake. 3.- Using a coloured bottle is a way to apply colour to the body. “Solar elixirs” have been known and used for centuries in Colour Therapy. They are, basically, water that has been placed under the sun in a coloured container so that the liquid will absorb the Sun’s energy and the energy of the colour of the container. The colour Blue stands for relaxation, communication, regeneration and sleep. It is used to treat a variety of conditions such as high-blood pressure, stress, sleep problems and headaches. It aids meditation and spiritual growth, because of its calming effect on the whole organism. Therefore, drinking blue water will introduce the calming effect of the colour blue into your body, relaxing your mind and gently removing your worries away. 4.- Blue is the colour of the Throat Chakra, the chakra related to communication, expression of one’s self and creativity. By drinking Blue Water we are balancing and empowering this chakra, which when weakened can lead to an inability to express one’s needs and opinions, to a feeling of being “choked”. On a physical level, a weakened 6th chakra can manifest on sore-throats, nervous coughing, laryngitis and hoarseness. 5.- Even if you are not sure you believe in the healing properties of this water, it is just water, it will do you no harm, on the contrary, drinking enough water on a daily basis will improve your skin, your digestion and your general well-being as your body won’t be making-do with whatever minimum amount of liquid you decided to give it that day. So, there is nothing to lose and much to win. When should you drink this water? Any time, all the time! You can add it to the water you use for pasta, coffee or tea. Mabel Katz, who studied Ho’oponopono with Dr. Len, says on her site that one drop of solar water can turn a whole pot of water into solar water too, so you don’t need to use much. You can also spray it on your plants which will grow much healthier, on your rooms, to cleanse them, you can even use it to wash your hair; so, there you go, no excuses! It can be used for everything! Personally, I just prepare it and drink it. There is something in me that says: if you boil it, you’ll kill everything in it, but what do I know? I just like the way it tastes, so I drink it pure. 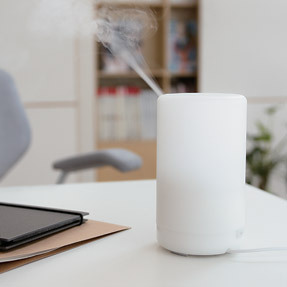 I also have an aroma diffuser which uses water to spread the scent, and I sometimes fill it with blue water so that it spreads throughout the house. You fill it with tap water (can be mineral water if you prefer), close with a cork or a plastic cap or even some film and leave it in the sun for an hour. Then you keep it in the fridge in any container you want and use it daily, whichever way you prefer. Don’t use a metal cap to close your bottle. Note: I’ve tried to find out why you should not use a metal cap but without success. The closest answer was that the metal “might” react with the sun and change something in the water. However the reason, Dr. Hew Len and Mabel Katz both are very specific about using a plastic cap or even just a bit of cling film and an elastic band, just not a metal cap. Pingback: Hungarian Lemonade | Namaste to you Sir! Pingback: Monday Meditation: Meditating with Ho’oponopono | Namaste to you Sir! Pingback: Tuscan holidays: Zucchini and red pepper fritatta. | Namaste to you Sir! In my house no sunlight comes…so how to charge the water. If sunlight unavailable then we need to keep the bottle very near to bulb or in room where bulb is ON. Exactly! 🙂 Thank you Raju! What in case there is no sunlight due to rain, then how to charge the water. I read in many sites that the the blue solar bottle has to be a cobalt bottle. How do I know if this is true or not? & Was that mentioned in “zero limits” for Hew Len? I read in many sites that the blue solar bottle has to be a cobalt bottle. How would I know if this is true or not? & Was that mentioned in “zero limits” for Hew Len? To answer your question: I have never read about the blue solar bottle having to be cobalt. In “Zero Limits” Hew Len just says the bottle has to be blue glass, and also not to use a metal cap to close it (I think I forgot to put that on the post ), he doesn’t say it has to be cobalt. Why do you not want to use a metal cap to the bottle! I’ve never heard this, and have used the original metal caps that come with the bottles for several years now. Just curious where you heard this and why? Thanks! Hi Janet! Sorry it took so long to reply! I read about blue solar water from the website of Mabel Katz. She said not to use a metal cap, but she didn’t say why, I did some research and found that many other sites said to avoid a metal cap, but again, I don’t remember reading why. Since I learnt about ho’oponopono from her site, I followed her instructions 🙂 Still, I would like to know why though, so if you find out, please let me know 🙂 I’ll do some research myself and if I find out why (or that it actually makes no difference) I’ll update the post 🙂 Thanks for the comment!! Pingback: Ho’oponopono in a nutshell | Namaste to you, Sir! I just recently came along Ho’oponopono and the Blue Solar Water and I love it. 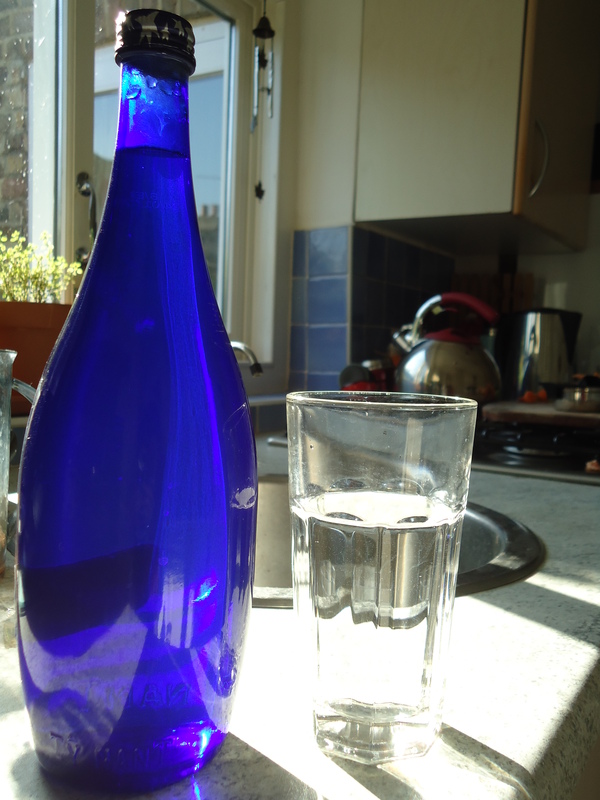 I have a blue glassed former wine carafe and I made water already 2x using a bit blue solar water into my cup and, again, feel it with normal tap water. The texture of my cup of water changes immediately, just fantastic. I am too, don’t like put the blue solar water to be cooked or boiled. However, what I do is I put a bit of blue solar water into my finished cooked coffee or tea, soup etc. Pingback: Ho’oponopono Tools | Namaste to you, Sir! Sounds awesome will definitely try this. I’m familiar with Emotto’s work.will pass it on. 🙂 Thanks! The work of Masaru Emotto is amazing! Hi! Thanks for your article! I was wondering if you need a cap at all? Will it work if you leave it out in the sun in the blue bottle without a lid? The bottles I have don’t have lids (used to have metal corkers I’ve removed). Hi Honmei!, Sorry for the late reply, life has been a bit crazy here. 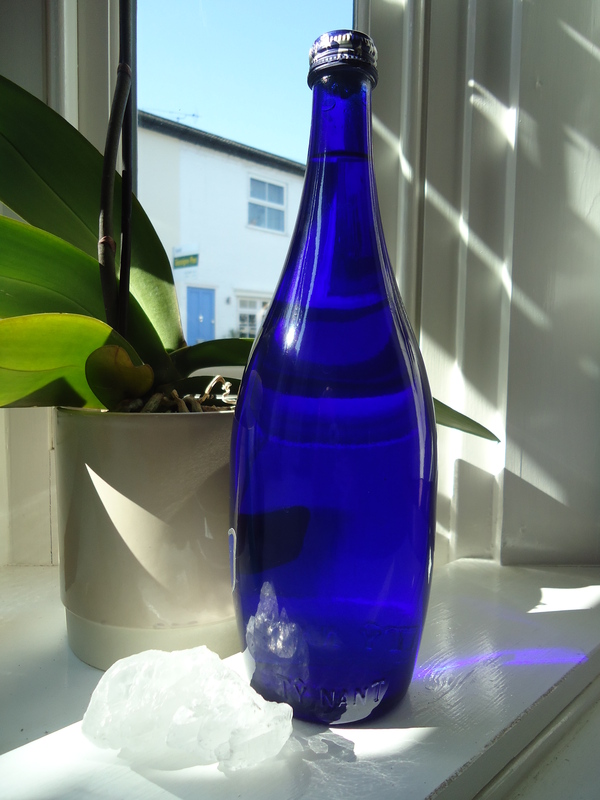 This has been a lovely Summer in London, with lots of sun to make Blue Solar Water every day, so I have been using bottles with and without caps, just any blue bottle I had lying around. Hope this helped! Have a great day! Follow us via email and receive notifications of cool new posts by email.